The Key to Metal Bumping , Frank T. Sargent's treatise on auto body repair, was first published in 1939 by Martin Sprocket and Gear, of Fort Worth, Texas. They were makers of Fairmount body and fender tools. The book was published as a promotion of their tools and the Fairmount method of body damage analysis and repair. This slim volume sells for close to $100 as a first edition, and a copy of the third edition (1953) can be purchased new from the Eastwood Company for $10. Measuring 5" x 8", with 126 pages, it rests somewhere between a pamphlet and a book and can easily be read in one sitting. This is the classic (pre-plastic filler) book on body and fender repair and it contains just about all a novice might need to know about basic sheet metal repair and restoration work. This is very much a practical volume giving the beginning body and fender man only as much information as he needs and giving it in as clear and concise a manner as is possible. In essence he gives us a strategy to approach the dented or crumpled sheet metal, tells us which parts of the dent are direct damage and need work and which are indirect damage and will sometimes naturally return to its original shape. He discusses the use of the various hammers and hand anvils (dollies) and how to hold and use them. In addition he explains when to use heat (oxy-acetylene) and how to shrink and work stretched sheet metal back into shape. Brazing and its application to body work is also discussed. No mention of plastic filler is made. 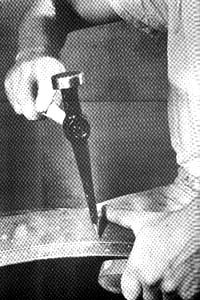 Lead as a filler (torch soldering) is discussed briefly, as are its tools and their use. This edition's one drawback is that some of the photographs suffer from being re-photographed from the original book. They are dark and not as clear as they might be. That is a relatively small criticism as many of the illustrations are crisp and clear. If you know nothing of body work and want to try it yourself using traditional tools, techniques and materials, this primer is the one to buy. Eastwood also offers inexpensive hammer and hand anvil sets. Standard Guide to Automotive Restoration by Matt Joseph, Krause Publications, 1992. Matt Joseph is a college history professor whose interest in old cars stirred his interest in history or whose interest in history stirred his interest in old cars. In either case he has written a remarkable book for the beginner in automotive restoration. Although he restores antique Lincolns and Aston Martins he barely mentions them and dwells instead on automotive systems and how they evolved over the years. He does mention brands occasionally but only to illustrate specific points. His discussions are illustrated with 400 photos and drawings. See for example an illustration of the old technique of hand fitting piston pins (30K GIF). This is a book primarily for beginners, or for those wishing to structure their efforts toward restoration rather than repair, and much of the book is devoted to that difference. Joseph explains how many techniques used by body repair shops are effective for short term repairs but work counter to restoration and long term survival of sheet metal. I found most interesting his discussion of what happens to sheet metal when stressed (dented) and how a simple dent can change the structural properties of the metal and make the removal of the dent far more complex a process than simply banging it back into shape. This explained to me why I couldn't adequately pound out small dents in my tailgate that looked so easy. He makes the observation that often a complex curve as one might find on the fender of a 1939 Chevrolet fender can be easier to work on than the almost flat door panels on a Model A door (or by extension a Jeep). I compared the Haynes body repair manual to the section on bodywork in Joseph's book and the difference is striking. Not that one is wrong and the other is right, but there is a huge difference in approach between repair (Haynes) and restoration (Joseph). See the illustration here of the use of the pick and dolly. His section on body preparation and painting is excellent and illustrates common mistakes in surface preparation and painting. He cautions that certain modern paints, while quite effective on modern cars, leave a surface not available when the older auto was built, and are therefore not suitable for most restorations. While not a substitute for good manuals, he puts your vehicle in perspective so that when you work on a fuel pump you will have some notion of why it works and what preceded it. There is the suggestion that when all else fails, use common sense. In one instance he recommends a non-explosive method of repairing leaking fuel tanks which is really quite simple, effective and approved by an agency of the federal government. Written with a self-deprecating sense of humor, this book tells the reader that not only does restoration need to be done but that you may just be the person to do it. The surprise was that I didn't think a book on auto restoration could be this interesting. I recommend this book highly to the CJ owner considering restoration of his vehicle, or anyone just wanting to know what restoration is all about. "There was a post about body work ('metal bumping') which recommended the book Automotive Restoration by Matt Joseph. I bought the book through an internet book store. In my opinion the section about metal bumping left a lot to be desired, for a rookie, but it did recommend the following book. Looking through more book stores, I found The Key to Metal Bumping by Frank T. Sargent, ordered it and it is good, for about $9.00. We all have pieces and parts that need dings removed. This book makes it a lot easier to understand. A must for all us WT'ers. Cuts down the massive amounts of 'Bondo' that most of us think we need."